EDA industry friendly charging system has made Quadcept popular. Quadcept offers a very simple license fee system. You only need to pay license fees for when you need it and sign up with a monthly plan. It is very flexible so you can sign up for a month and stop, resume the license when you need it again. 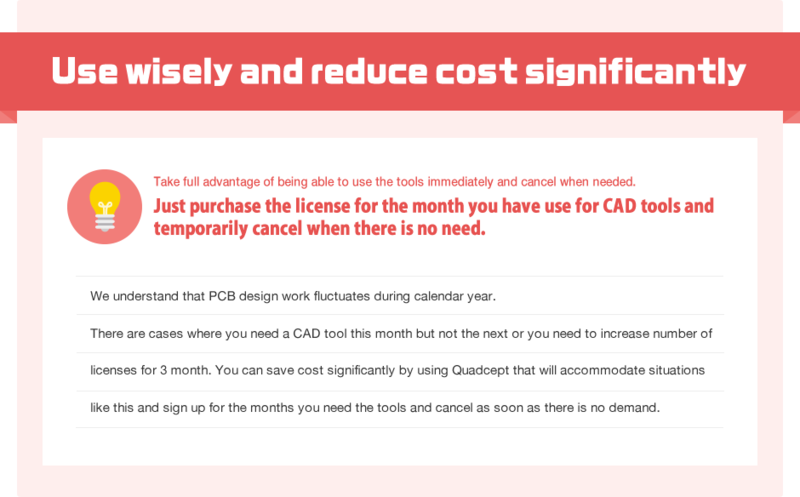 Quadcept is perfect for the EDA industry where usage for tools fluctuates throughout the year. Don't worry about excess cost and focus on your design! We do not have any expensive package price that cost tens of thousands dollars. You never have to worry about high cost of get an additional license. All you have to do is pay for the number of licenses you would like for the time period you have specified.